This year i had a go at batch making Christmas cards and envelope. Hi there, how are you. Did anyone turn around this week and say “good grief it’s December and I’m not ready!” I have to say it happens to me every year. Most people make their Christmas cards in July or August but me, nope always leave it till last-minute. I fished about in my stash and found Clarity deer stamps I hadn’t yet used (I buy this stuff and forget to use it, seriously!) Thinking they would look good in a forest setting I had another rummage around but all I could find was some smallish tree trunks from the back of a magazine. These would have to do. This is the little jig I set up to place my stamps. There’s a crease at the top and bottom to place the card. After setting everything out I made myself a little stamping jig (fancy name for two bits of scrap paper and some masking tape). Set the deer, tree trunks and sentiment in place on acrylic blocks, and off I go. They came together so easily. Stamped and embossed in next to no time. 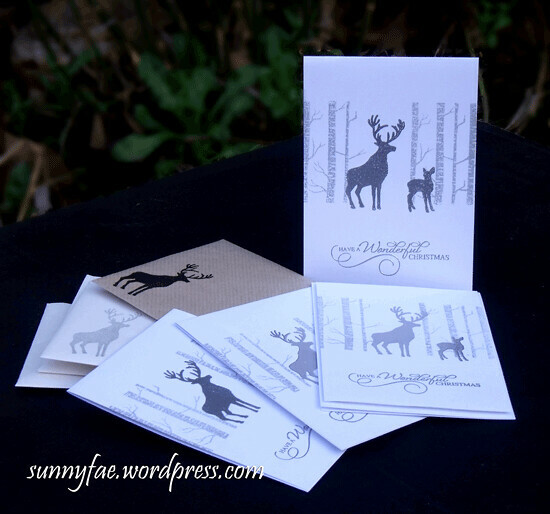 I even made some envelopes out of a spare roll of paper and stamped a little deer on those too. 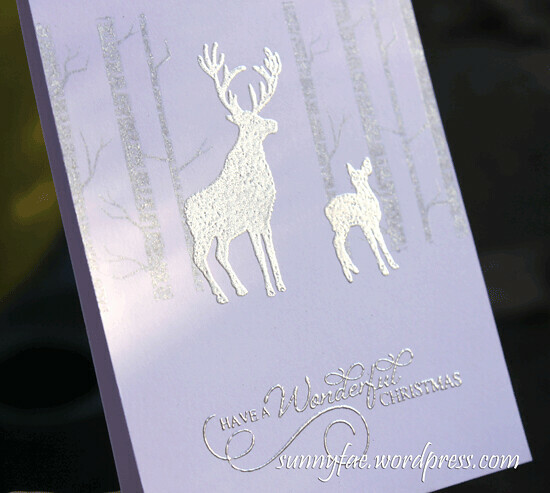 This is a close up of the batch made Christmas cards shining nicely in the sunshine. To change it up I added a clarity forest mask, it has an inny and outy (mask and stencil?) just what I needed. The trunks were stamped through the outy and I blended the shadow around the inny, ribbon and gems added because it’s Christmas so why not. With a little more work and the aid of a stencil I get a different look with a similar design. 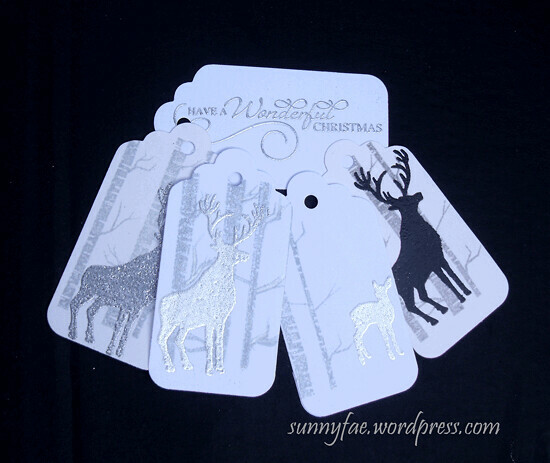 A few of the Christmas tags made with the mishaps and waste. There were a few mishaps and practice bits and I turned those into tags, so everything matches. Nothing much to do now hopefully but buy and wrap the gifts, I may make some gift toppers like the ones I made last year just change the colours to match the paper. I’m really happy they turned out so well and now I can get on with really enjoying the festive season. Hows every one else doing, are we all getting there? 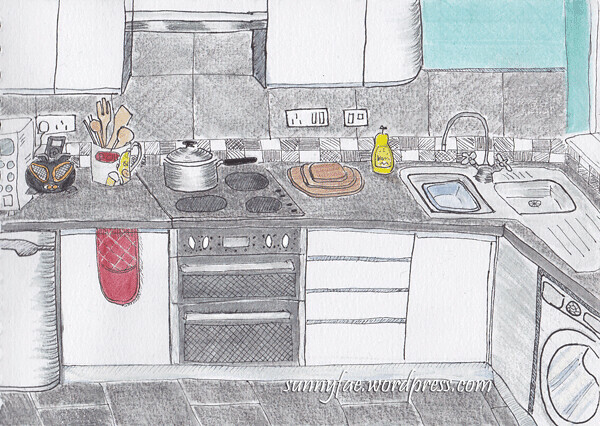 A drawing of my kitchen for sketchbook Skool class. This was the last week of sketchbook skool klass. The delightful Tommy Kane showed us its all in the details. If you look at his work you can see the amazingly detailed illustrations he draws that sometimes take him hours. Hours of standing/sitting around on location working busily away. This is a picture I drew of part of my kitchen, not nearly as detailed as his but I liked the way it turned out. The paper isn’t good for watercolour so I used inktense pencils and put just a light wash of water over the top. I like the texture it gives against the tooth of the paper. A drawing of a pomegranate just before we ate it for dessert. 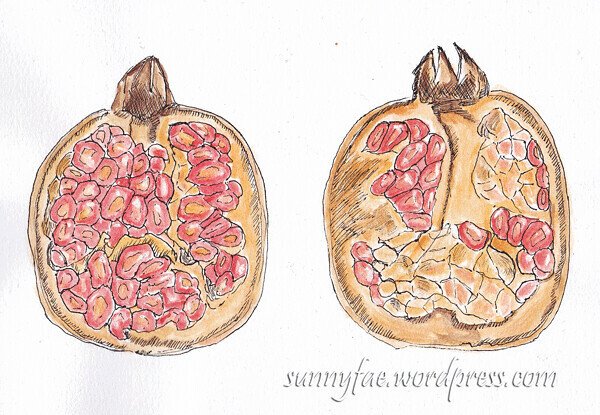 I was making a dessert and cut open a pomegranate, spurred on by my kitchen drawing I decided to have a go at drawing it in detail, seed by seed. It came out quite well. Not something I would have thought to do till now. This class seems to have come and gone in a heartbeat, I’ve learned a lot, now I have to put all this new-found knowledge into practice. I’ll probably go back and look at some of the videos again to keep it all fresh in my mind. The information was geared mainly to people who keep (or want to keep) journals but it is all good information and can be used for all forms of drawing, and who knows maybe I’ll do that one day. I’ve bee making birthday cards. 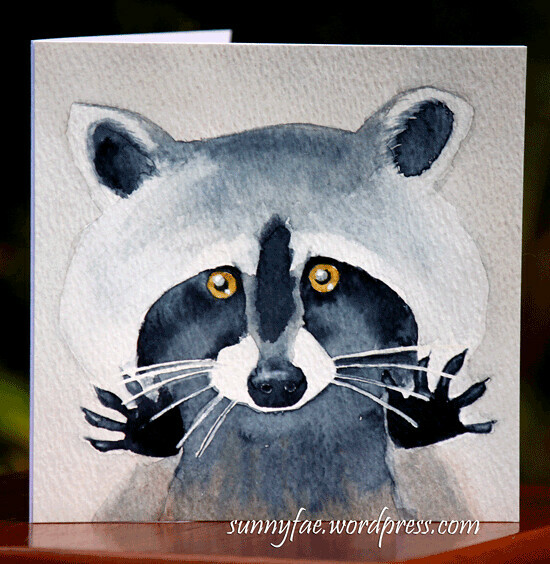 This one was a picture of a racoon (picture from a google search**) painted in watercolour, I even used watercolour paper! I wanted it to be kind of washy with not too many colours, I used Payne’s gray and burnt umber with a tiny bit of orange or the eyes. It’s not perfect but he’s kind of cute. This one is made with a stamp and dies from crafters companion magazine set. I like that the dies match the stamps, the leaves are small enough for a background and big enough to use in their own right. 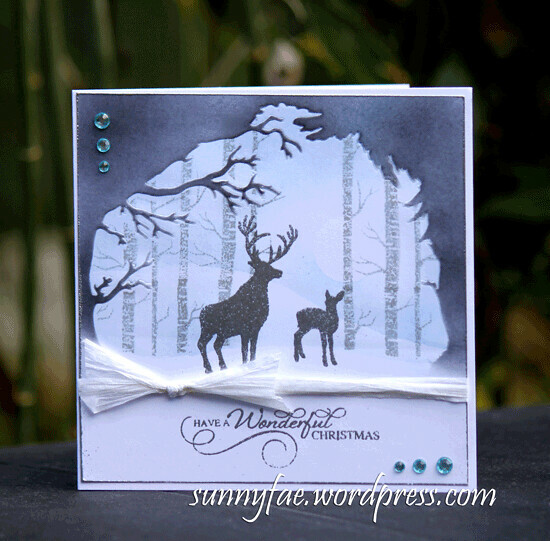 The patterned paper was made with a piece of white card blended and stamped with distress ink. 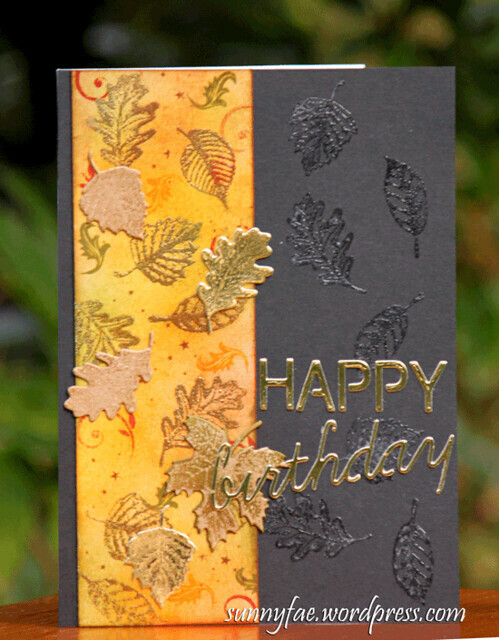 The extra leaves are gold card; craft card and the black background are stamped with embossing ink and heat embossed with clear powder. Hi there. Happy Fathers Day. Hope all the dads are having a very relaxing day. This week at watercolour class we were being experimental. It was a sploshy technique involving cling film and scrim. Scrim is a very loose weave fabric found in the building trade, though any loose weave fabric would do. I pulled out threads and distressed the scrim. Cling film was also used on this page just to see what would happen. I made a wash of watercolour and dabbed it all over the scrim and the rest of the page, then laid cling film over the rest of the page and scrunched it up slightly to make the texture. It was put aside to dry for a couple of days. Once I had my lovely new texture, what to do with it? We were supposed to see some kind of image or pattern in them but I’m rubbish at that and after staring at it for what seemed forever decided it would be used as patterned paper. I learned something new and even though I’m not sure I’ll use it too much in the future, should I need this type of effect, I know how to create it. This is the card I used it on. “Happy Fathers Day dear”. The watercolour paper was used as a background for my dragon stamp. He was stamped onto a separate piece of orange watercolour paper (one of the experiments that didn’t work) with black versafine ink and heat embossed with copper coloured powder. I cut him out and glued him down. 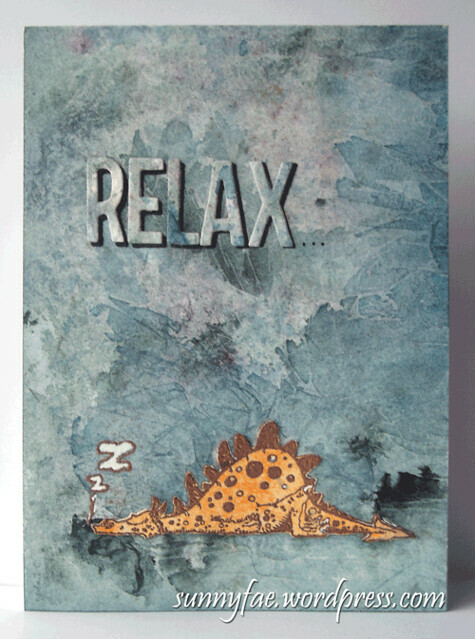 Since he was snoozing I used die-cut letters to spell RELAX… (inside it says put your feet up and have a good day). The other half said it looked pretty cool so job done I think. 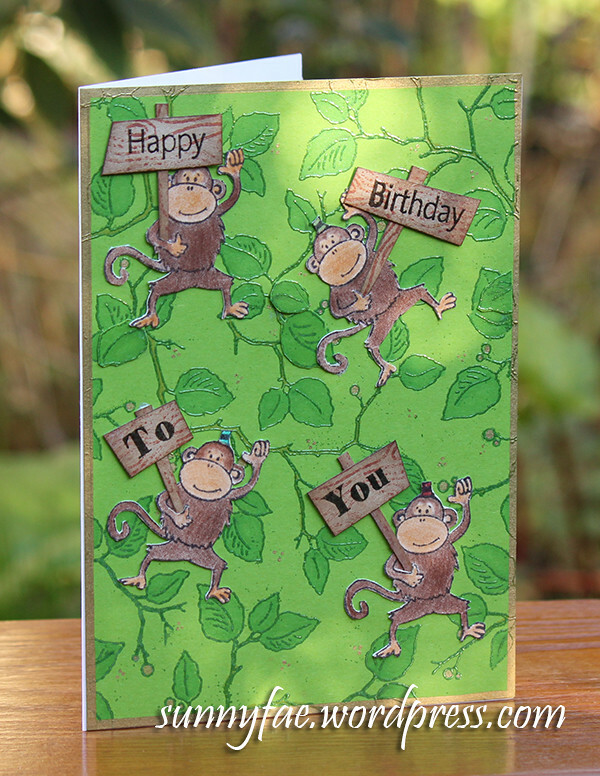 I’ve been watching monkeys on TV and so have been inspired to make this little birthday card. I used my favourite leafy stamp again, on green card with green embossing powder. The leaves and branches are coloured with pro markers and sharpies (I only have about eight pro markers). The signs were stamped with a bark stamp and cut into small rectangles. I brushed some distress ink around the edges for definition. I only have one monkey stamp so it was stamped out four times and they were coloured in with pencils (my brown alcohol pens are too dark). Once coloured I cut them out with small sharp scissors. I tried to stick the monkeys down so it looked like they were just hanging around in the trees. The green card was cut down to fit a 7”x5” card base and before gluing it down I took a gold marker around the edge to form a border. I really enjoyed making this card, it made me smile. This birthday card was made for my sisters fortieth birthday. Happy Birthday sis. 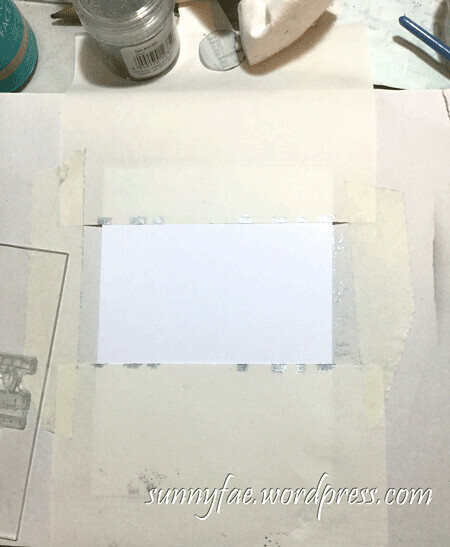 The background was stamped with embossing ink and heat embossed with green embossing powder. I’ve coloured it in with watercolour and matted it onto purple card. 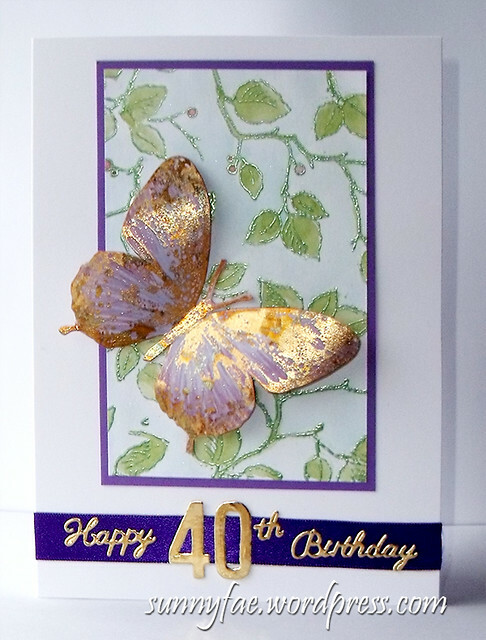 I have added a strip of purple ribbon with double sided tape across the bottom and die-cut a sentiment from gold card. This is exciting because it’s the first time out for my new Christmas dies. I think I’m going to get a lot of use out of these. The purple and green are a nice colour combination, I really like it. I’ll have to try to remember to use it again. I gave the card to her this weekend and she liked it so I’m calling that a success. The day is getting closer and this year I’m trying to get the prep done a little earlier. I don’t want to leave everything till last minute like I usually do. I’ve made some gift tags with an owl die I had free with a magazine. I thought they would make cute reindeer faces. All of the shapes were cut out with dies and stuck down with PVA glue. The antlers were cut with a snowflake die chopped into three parts. The base shape is spellbinders labels#4 gold ( labels#4 is one of my favourite shapes) in silver mirri card. Most of the backgrounds were paper made to test different colours and embossing powders, some silver, clear and white all with various blue inks blended on them. I used part of it in the village scene from the previous post. When the paper ran out I used a piece of wrapping paper. This is what the paper on the tags looked like before I covered them up. This one is clear embossing powder on white card blended with blue ink. I used cotton yarn instead of ribbon for the ties because I didn’t want to cover the words up then threaded small paper beads and tied knots onto the ends to stop them pulling through. So they kind of look like reindeer right? Maybe if you squint and look at them sideways? I may make others I’ll have to see how many more I need, or maybe i’ll leave some plain like this for the more serous members of the family but really who doesn’t love reindeer? Hi there. How are you? The Day is getting closer, I really need to get organised. This is a little village scene Christmas card. 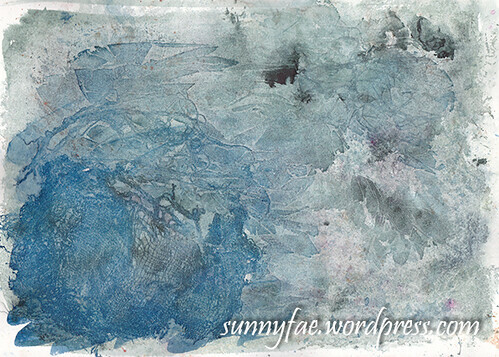 The blue background was a background paper I had made testing different colours and embossing powders. The rest will be used on other projects, only a small portion was used on this card. 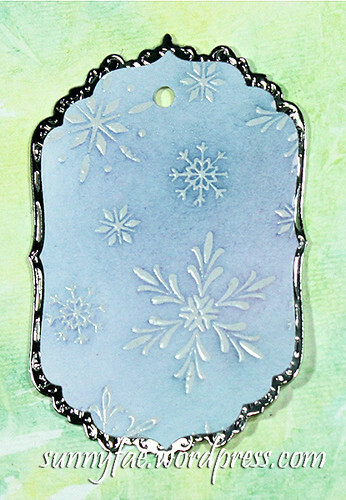 This part was stamped with a snowflake stamp using embossing ink and heat embossed with silver powder. Blue Distress ink was blended over the top. The buildings were one whole strip die cut out of white card, cut up and arranged on top of each other to make a little scene. I cut the bases of the buildings as circles to match the blue circle for the sky. The layers were put together with foam pads to give some dimension then matted onto a slightly larger mirri card circle. 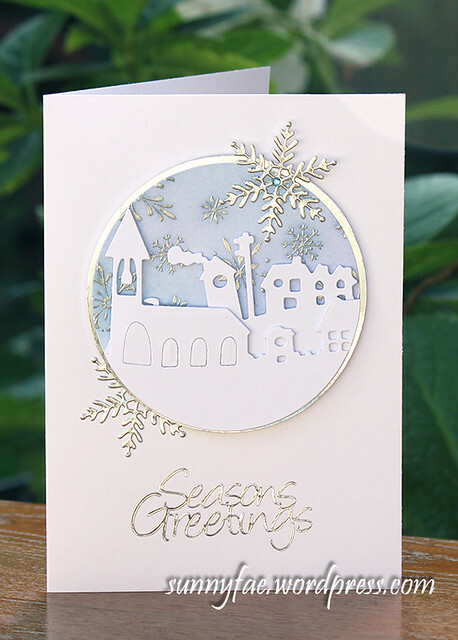 The die cut snowflakes were added and a peel-off for a sentiment. The last few cards have peel-off sentiments because I found a load of them in the back of a draw and they need using up. Then I can fill the space with new stuff I need hehe. I’m trying harder to organise myself this year, I probably still be going till the last minute but hopefully there will be more relaxing if I can get the main stuff done before December. Hi there. How are you. This is a good one for batch cards. They’re not too big and are reasonably quick to make. I was watching crafty telly thinking “ I really like those stamps, I may need to buy them” when I realised I already had some similar stamps by the same company (Card-io) that I’d hardly used. They are tiny little stamps that are used to build up pretty effects and designs. I even have a set of stamp pegs! 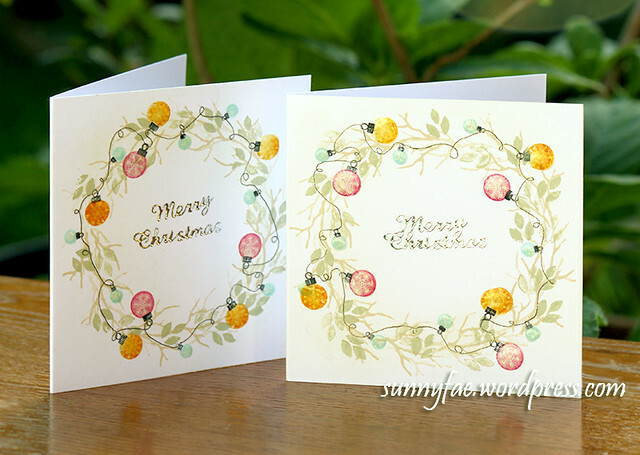 To make the cards I used an inny and outy cut of a circle die to gently blend a little distress ink. They were just slightly offset to show the circle where the edges touch. This gave me a slight pattern to follow. With a branch stamp I stamped 1st and 2nd generation with a beige ink pad, then with a sage green, stamp some leaves (again1st and 2nd generation) Stamping like this adds a some depth to the wreath. The three bauble stamps were stamped in red yellow and blue and the tiny little hangers are black. It looks fiddly but I used the acrylic stamp pegs with a stamp on each end so it was really quick. A micron pen was used to add in the curly ribbon. I drew on top of the same line and on the baubles with a clear star glitter pen to add a bit of sparkle. I used glossy accents on the baubles to add some shape and dimension. A peel-off for the sentiment and were done.